Farmington, Virginia (now West Virginia), U.S.
Benjamin Franklin Martin (October 2, 1828 – January 20, 1895) was a nineteenth-century politician, lawyer and teacher from Virginia and West Virginia. Born near Farmington, Virginia (now West Virginia), Martin graduated from Allegheny College in Meadville, Pennsylvania in 1854 and taught school in Fairmont, Virginia (now West Virginia). He studied law and was admitted to the bar, commencing practice in March, 1856. He moved to Pruntytown, Virginia (now West Virginia) in 1856 and was a member of the West Virginia Constitutional Convention in 1872 and a delegate to the Democratic National Convention in 1872 and 1888. 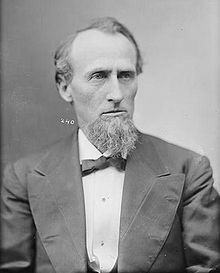 Martin was elected a Democrat to the United States House of Representatives in 1876, serving from 1877 to 1881, unsuccessful for renomination in 1880. He resumed practicing law in Grafton, West Virginia until his death there on January 20, 1895. He was interred in Woodlawn Cemetery in Fairmont, West Virginia. United States Congress. "Benjamin F. Martin (id: M000169)". Biographical Directory of the United States Congress. This article about a West Virginia politician is a stub. You can help Wikipedia by expanding it. This page was last edited on 9 March 2017, at 19:35 (UTC).